Timbre for violin. The Timbre string set is the best that Warchal have made so far, utilising all of Warchal's knowledge and experience. It combines gut-like sound and response with the extra projection and stability that synthetic strings can deliver. Click here for the current list of makers and repairers who can supply and fit Timbre strings. 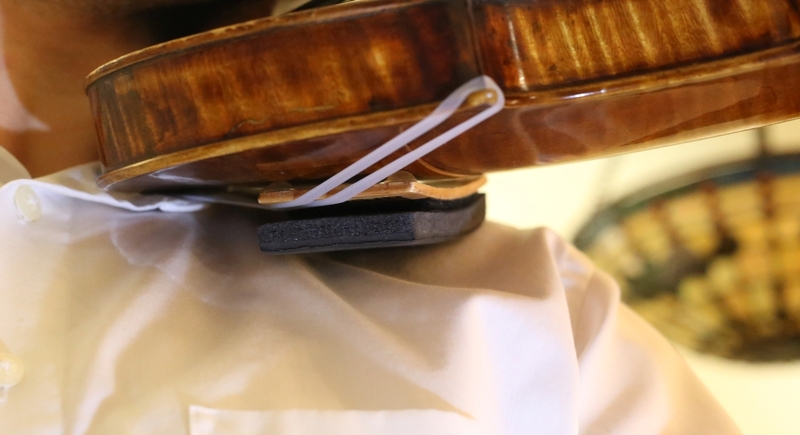 ArcRest is an exciting new shoulder pad system for violin, viola and fractional instruments that enables an ergonomic playing position and freedom of movement. Completely handcrafted in the USA by two professional musicians. There's a very special new rosin coming from ANDREA in 2018. Sanctus celebrates the 10th Anniversary of ANDREA rosin under the direction of Peter Bahng. This is a stunningly beautiful rosin with a very special new formula and two part design. Full details and pricing will be announced soon. 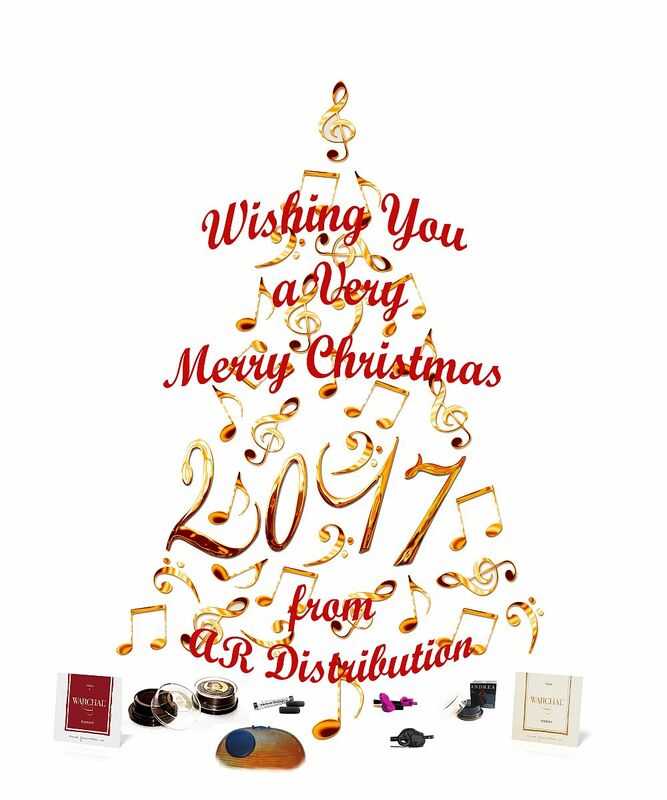 Our thanks go to all of you for making this a wonderful year! 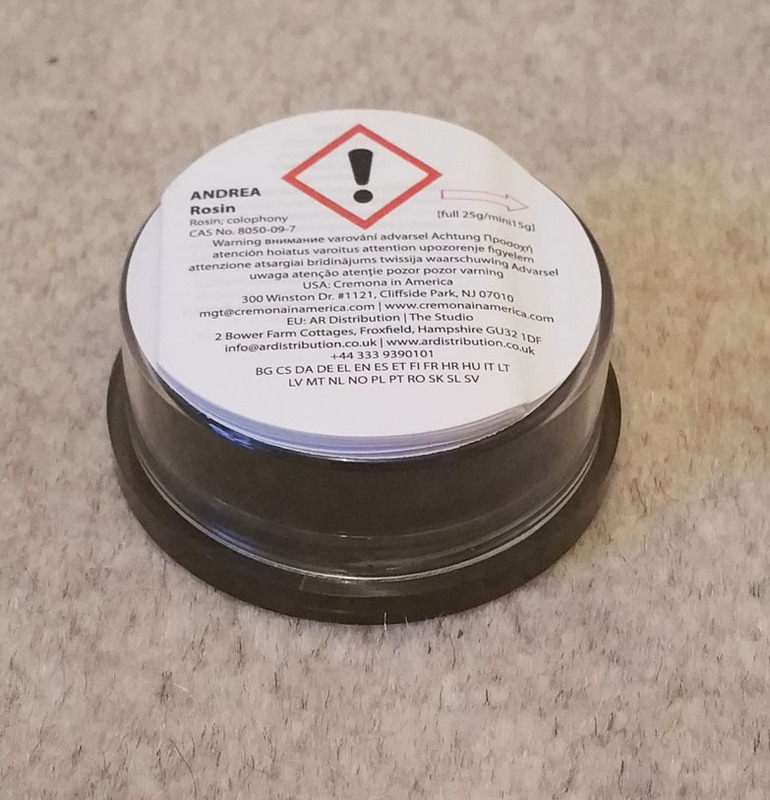 The safety data booklet label used for ANDREA rosin because it contains rosin/colophony is changing design. 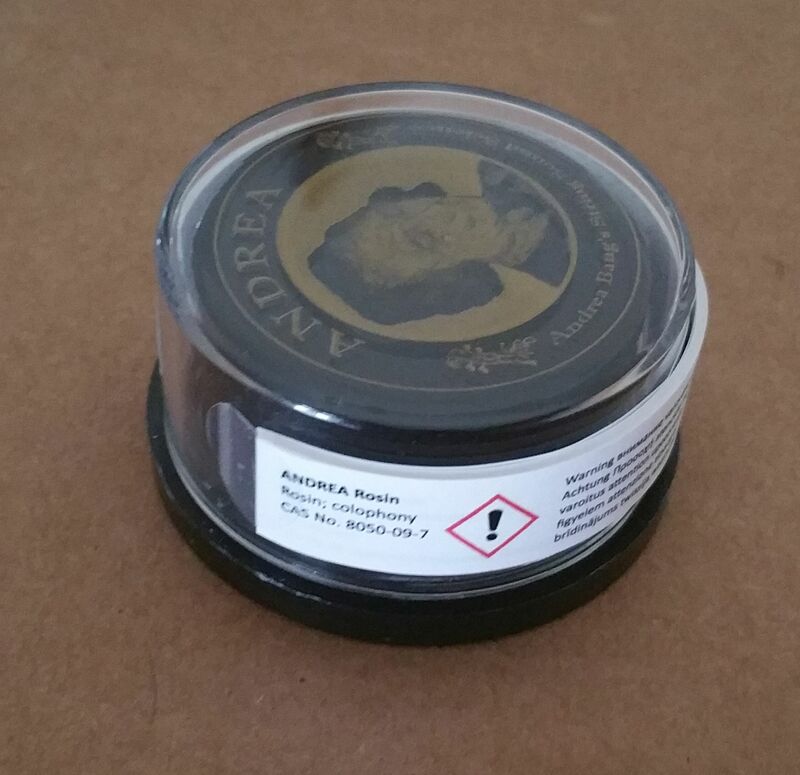 This new label which is gradually being phased in sits on the top of the rosin rather than wrapping around it. We were delighted to be at the ESTA Summer School 2017 in Chichester and to welcome Bohdan and Anna Warchal to the UK. 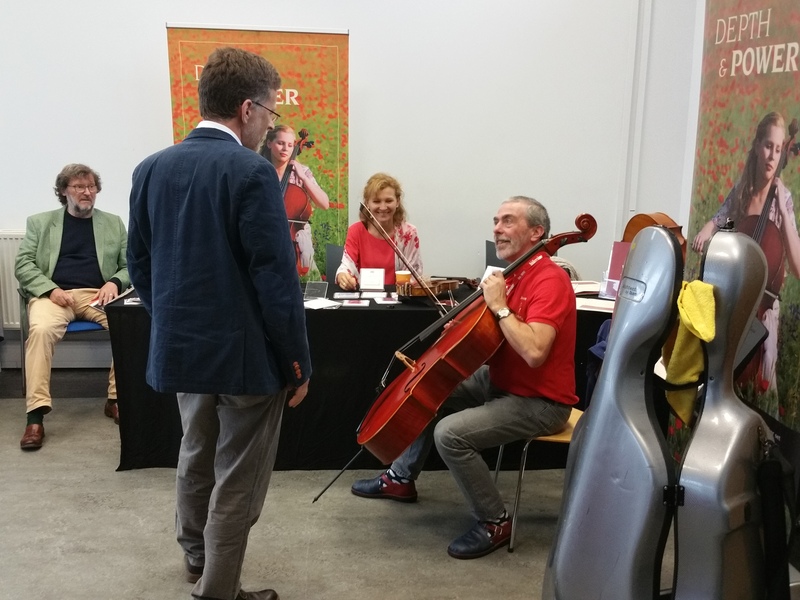 Here you can see James Halsey Director of the Aboyne Cello Festival talking with Bohdan and Anna Warchal and Graham Elliott. In June 2017 the EU labelling regulations changed (ECHA/REACH). This meant that because there is no small item exemption any more, all rosins that contain rosin / colophony ought to be labelled as such with the relevant hazard warning for colophony. ANDREA rosin most definitely contains a wonderful blend of rosins together with other special ingredients. So you will see that ANDREA rosin now wears a small multilanguage booklet label. As with everything, there comes a time when a refresh and rejig are needed. So for summer 2017 we have a newly tweaked website design. All comments and feedback are welcomed because the most important thing to us is that you can find what you need easily and quickly. We'll be at the ESTA Summer School exhibition this year on August 9th. Bohdan and Anna Warchal of Warchal Strings will be exhibiting. We look forward to meeting everyone who will be there! 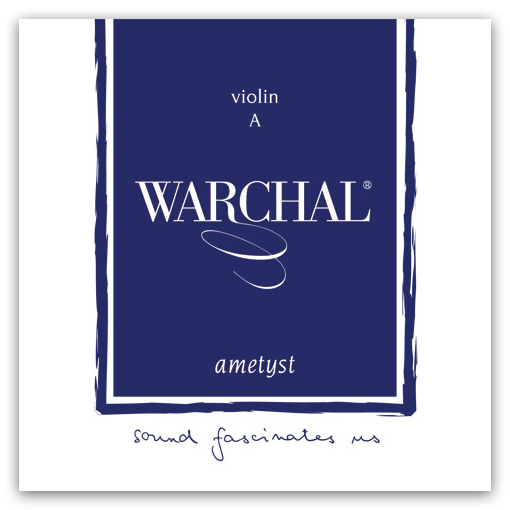 After requests from customers Ametyst fractional violin strings are now available in 1/16th size. The Amber cello set offers a bowing experience closer to that of playing metal core strings. The sound is darker and more robust than the Brilliant set and feels more immediately powerful to the player. Amber offers more 'golden' tonal colours and we'd describe the tone as more immediately compelling and serious. Now in stock; Frogs, Hold Fish and Cellophants. Invented by two Suzuki teachers in the USA and made from medical grade silicone rubber Bow Hold Buddies are an excellent way to gently form an effective bow hold using muscle memory.